If you saw any of the two vehicles involved in a horror smash in Portadown that has left one driver with serious injuries, PSNI Craigavon would like to hear from you. In a post on Facebook, they said this morning "we're fortunate there were fatalities" following the two vehicle RTC on Portadown's Ballyhannon Road on Thursday morning. 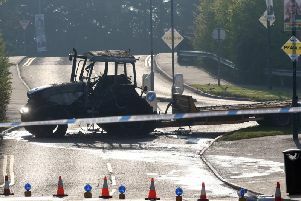 Along with an image of the two cars, one of which was completely crushed in the smash, they said: "Were you on the Ballyhannon Road, Portadown two days ago, Thursday 11th May at around 7:15am? "Did you see a white Toyota Hilux or a green Subaru Forester travelling on that road? Both were involved in a collision which we are investigating. "As you can see from the pictures, we're fortunate there were no fatalities. It has however sadly left one of the drivers with serious injuries. "We'd like to hear from anyone who saw either vehicle before the crash, or anyone who came across the incident who hasn't yet spoken to police. "If that is you, please call 101. The incident number is 164 of 11/05/17. Thank you."